Cassoulet is a rich, slow-cooked bean stew or casserole originating in the southwest of France, containing meat (typically pork sausages, pork, goose, duck and sometimes mutton), pork skin (couennes) and white haricot beans. 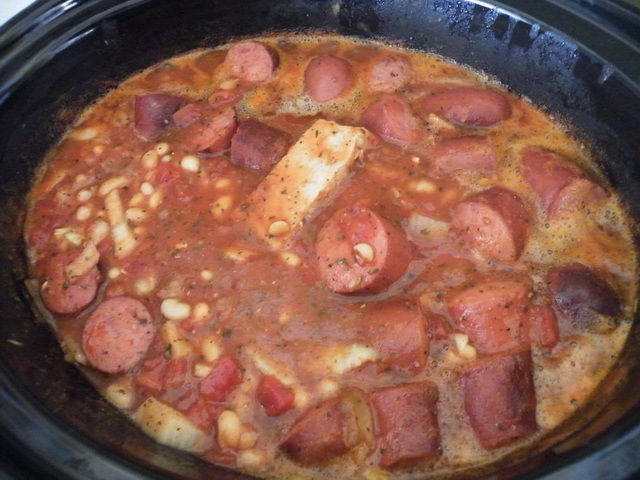 Put the all beans, tomatoes, stock cube and bouquet garni in the slow cooker and set for 4 hours cooking. Finely dice the onion and garlic and add to the slow cooker. Put the sausages with a small amount of olive oil in a frying pan (skillet) and cook until done. Slice the sausages into rounds and add them to the bean mixture. Add the pork chops to the pan and cook until browned. Cut up the pork chops into large pieces and add to the bean mixture along with the pan juices.